The forgetting curve by Hermann Ebbinghaus suggests that we forget 80% of what we learn within 30 days of a learning exercise. This famous theory suggests that traditional training methods can result in low rates of retention over time. To improve retention instructional designers have employed various tactics to engage learners. One of these is microlearning - learning in short, meaningful bursts that can be carried out more regularly. Here’s our complete guide to microlearning. Microlearning is a way to deliver training content to learners in bite-sized, focused bursts. Each unit or module focuses on an individual learning objective. Microlearning relates to the structure and the consumption of a course. What does the micro in microlearning mean? The word micro suggests that the units of content are small. But what exactly is the unit of measurement? Is it size, length, word count or detail? The answer lies in the experience rather than the content. The whole point of microlearning is the efficient consumption of training. If a 30-second video communicates the learning objective better or faster than two paragraphs of text, then that’s the medium to use. Microlearning describes chunks of content that each cover a unique learning objective. Think of them of as bite-sized learning activities. The goal is to communicate the learning outcome in the best or most efficient way possible. Video is perfect for microlearning because it’s a rich media type. Another good example is the use of infographics. A single infographic communicates a large amount of information in a concise, digestible format. We’ve even included an infographic later in this post to prove the point! 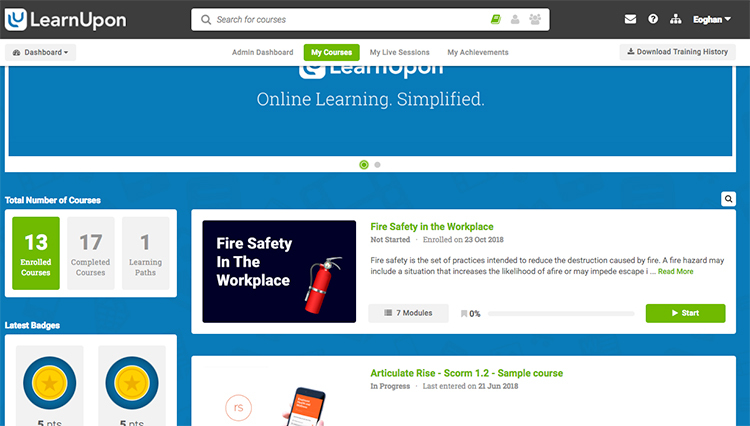 To show how microlearning can be used we’ll take a ‘Fire safety in the workplace’ course as our example. This course has an overall goal of reducing risk and keeping your employees safe. It can, however, be divided into distinct ‘chunks’. Each one covers a unique learning objective. The entire course clocks in at 15 minutes but is delivered in bite-sized portions. Each unit is an important element that stands on its own. Together they form a comprehensive course that benefits the learner. Faster course production Speed up course production with bite-sized units. It’s easier to produce multiple, self-contained units rather than one large, complex course. You can author more courses or frequently refresh your existing ones. Engagement Short bursts of content suit the working style and attention span of the modern corporate learner. It’s a constant battle for their attention and time, so tailor your content to be easy to consume and fast to complete and your engagement rates will soar. Better understanding Sometimes less is more. A short, simple explanation of a topic can be retained more easily than a more complex one. Ask yourself, what the learner needs to understand and use that as your focus. Improved retention The “cost” for completing microlearning units is lower so, they can be done more frequently. Remember the forgetting curve? The ability to refresh a learner’s knowledge more frequently boosts retention. Mobile learning Microlearning is perfect for the mobile learner. These smaller units of learning are less burdensome for 3g and 4g networks, and the time in which they take to be completed fits into their schedule. Whether it’s on their commute or at a hot desk, microlearning and mobile learning go hand in hand. Complex subject matter: If the subject of the course is highly detailed or complex it may not be practical to create a course with small segments of content. The rule of thumb is that the learner should come away from each ‘micro course’ with a self-contained learning outcome. If each segment requires a lot of explanation then a more traditional course may be a better option. Larger learning outcomes: Micro courses are great for an introduction to a topic or for refreshing knowledge. However, it’s not so great for building an understanding of a broad topic. Mixing microlearning elements with traditional courses taking the subject matter and the circumstance of the audience into consideration may be the best approach to benefit from both formats. If you’re rolling out microlearning in your organization or contemplating it in the future, there are some rules to follow. Always consider your audience Microlearning works well for some audiences, but not for all. So it’s important to determine if it’s right for your learners. Ask yourself: How does my audience usually learn? Do they have experience of a similar format of learning? Do their learning objectives suit a microlearning format? Will they have the resources (e.g. mobile access) to take the modules? Avoid complex topics: As previously mentioned, if the subject of the course is highly detailed and needs a lot of background information, it's not right for microlearning. Your learner should finish the course with a self-contained learning outcome. If segments require lots of context or are too complex to teach in a couple of minutes, creating a longer course is the smarter option. Add multimedia: Quick, concise training should be interactive. Adding video, images, gifs, and graphics will visually engage your learners and enrich their learning experience. Don’t add too much content: At a maximum length of 4-5 minutes, you need to keep your content focused. Only add the essential information your learner needs. Stick to concise, relevant information that gets the message across to your learner. Use gamification: Boost your microlearning engagement levels with gamification. Rewarding learners who complete the course through points, badges, levels, and leaderboards can be a novel way to make learning fun. Keep production quality high: Just because it’s a short piece of content, doesn’t mean it shouldn't be great quality. Cheap videos, grainy images and sloppy text can take learners out of the experience and make your training less effective. Keep it bite-sized: True microlearning should take no more than 5 minutes. Be strict when it comes to editing your course content to keep it bite-sized and digestible for your learner. Use relevant media :Video, gifs, and images are ideal for microlearning, but too many can clutter your learner's screen. Be disciplined with the media you choose so your learners can easily digest and quickly take their course without experiencing cognitive overload. Test your learners: Mini-quizzes, short questionnaires, and quick multiple choice exams are the perfect way to ensure that your learners are reaching their goals. Use appropriately: Microlearning can be incredibly effective at engaging your learners, but it's not a replacement for longer courses. Perfect for refresher courses or a taster as to what's involved with a larger course, remember microlearning is only one part of your overall learning strategy.